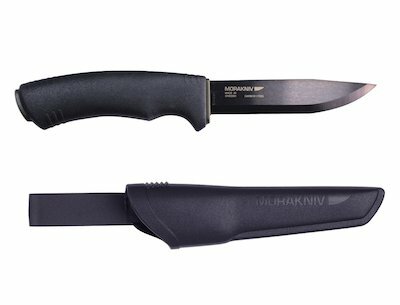 The Mora Black Carbon knife sports a 4.3″ blade made from high carbon steel. We could talk all day about the grip. Nice rubber handle here that gives you confidence when swinging this thing about. Suitable for all sorts of uses – In the woods, at the camp site or in your Bug out Bag. Verdict: Exceptionally tough and feels great in your hand. Up to any task and can take a beating. A nice dependable companion on any trip. Costing a bit less than some of the other knives in its class the Mora Black is well able to keep pace. Incredibly tough, this knife should be in every pack all the time. The rubber grip keeps you in control and the carbon blade does the rest. You can do almost anything with this knife – cutting cordage, preparing game, splitting down wood and intricate work like preparing feather sticks. Treat it well and it will serve you well. Not much can be said against this knife but a few people have mentioned that the plastic sheath is a bit average. Love this knife. Any amount of uses around the camp or in the wild or even in the shed. Very grippy handle so you are always in control. Strong enough for some of the harder work and holds a good edge.